...but I'm still cooking and have tons of yummy things. If you can deal with a little less commentary (and come to think of it, I'm probably the only person who reads it anyway), then I can provide more culinary amusement for you. Meal planning last time was a complete and utter bust - I don't know what I was thinking, trying to do a meal planning post the week before thanksgiving. Holidays screw everything up - simply because there ends up being so much to do around the holiday that regular dinner plans go out the window! Even better, I had an amazing dinner party menu all ready to do (and the food half made) when I came down with a rotten cold and had to cancel. Oh well, at least hubs and I enjoyed the two pounds of parsnip fries and three dozen stuffed mushrooms I'd already prepared for the occasion, hehe. Mix it all together, and you have awesome tuna salad. I served on fresh homemade whole wheat baguette with cheese and tomato. The other sandwich I made was even simpler - bottom of the baguette spread with (purchased) hummus. Top of the baguette spread with (purchased tzatziki). Then chopped red pepper, green pepper, tomato and cucumber. The other trick is to hollow out the baguettes a bit so the sandwiches stay together nicely. I made up four baguettes worth (24 sandwiches). The ladies didn't eat too too many, but hubs and I did a pretty good number on 'em. nice to have you back again! Please talk about the cake. It was so yummy. Yes, I'm a bit behind on reading things as well, and now am reading things backwards. 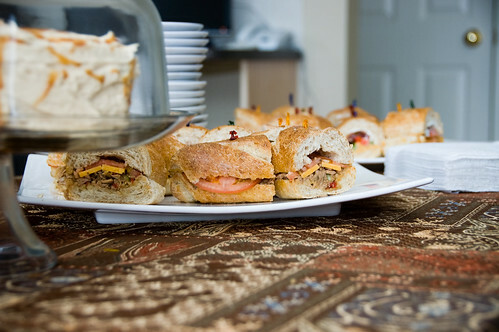 Loved the sandwiches, they were awesome! My hubby has been bugging me to print of the receipe for him.